Having spent a lot of time of the past few years looking at gardens and design I have noticed that by far and away the most fashionable of colours is purple. There are many flowers that produce the attractive colour and the theme often seems to be to break up the monotone green and grey of formal gardens with a modest splash of colour. Purple is often associated with regal origins and you will notice that in company logos the ones that go for purple are the ones selling premium or at least trying to give that impression. 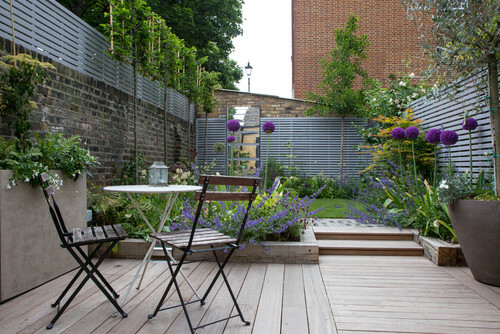 Luck would have it as well that green is only one shade away from purple’s complimentary colour of yellow so over all it works brilliantly for those who want a stylish and elegant garden that is restrained but colourful. 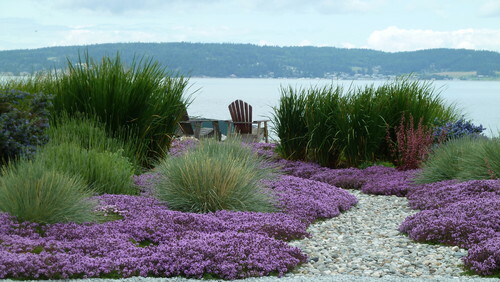 So without further a do let’s look at some examples of how designers have used purple in their gardens and see if you get inspired. The bright vibrancy of this photo really makes the healthy greens pop from the buxus hedges and the allium balls compliment them perfectly. 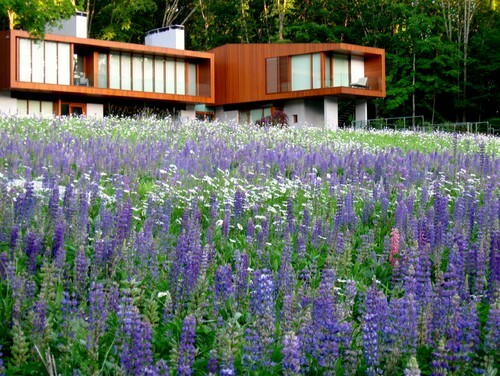 They are the flower of the moment and can be seen all over contemporary gardens due to their big colour and slim stem. A similar effect to the allium previously but the colours are more muted with the greens being on a darker scale. Along with the tall and spikey flowers, which I don’t know the name of, is lower growing lavender to give a variation in both tone and height. Like a stream leading to the ocean this purple path is a real attraction! The low maintenance flower could be something like Dalmatian bellflower or sand verbena but I can say exactly. This sort of flower I have seen several time before when the appearance of flowing growth is wanted. It could look great in one of my planters as a sea of purple. 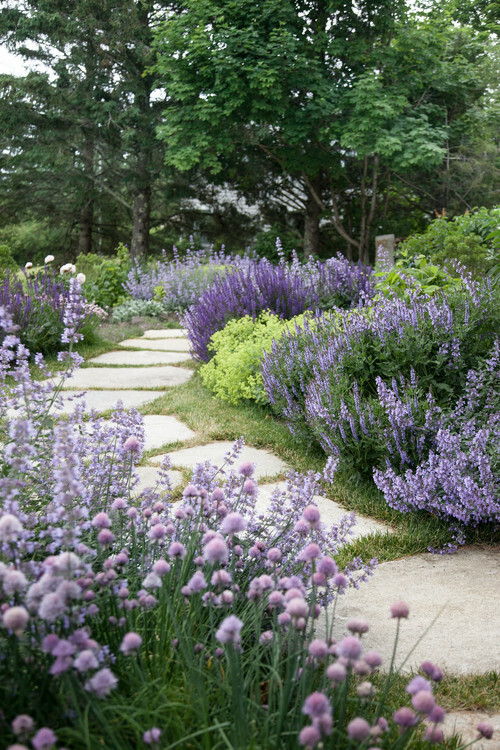 Lavender making another appearance here but in a more traditional environment. 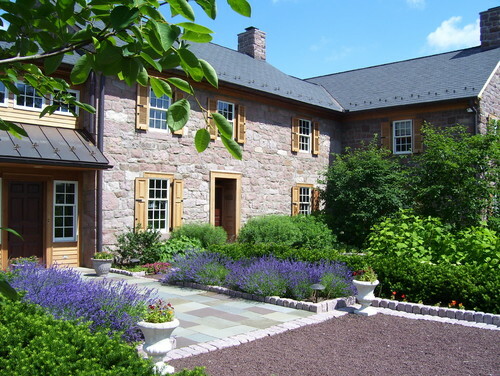 The classic English cottage would not be complete without Cotswold stone and a thriving bush of lavender in the garden. The plants very hardy and easy to maintain so it’s perfect for reliable garden colour. 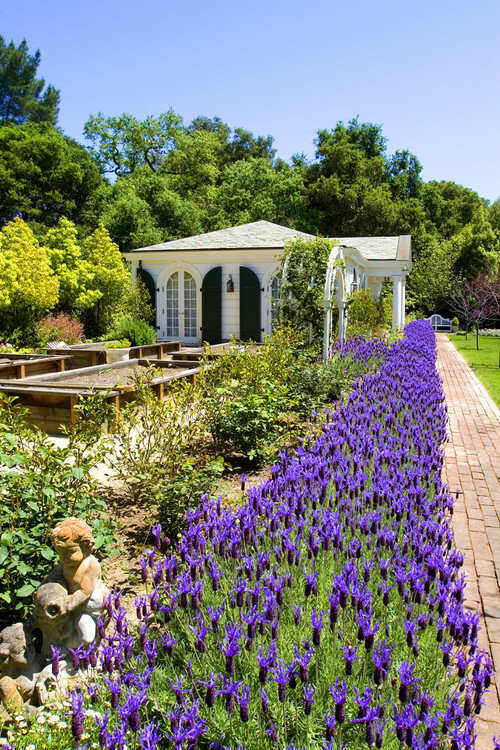 There is a great combination of purple flowers here and whilst the traditional English garden path might have solid lavender, as we have seen already, the designers here have opted to use various different purples to give different depths of colour. I can see chives in there, maybe some catmint and a couple of others. What I also like is the play of green with the purple so that there is a more yellow/green colour thrown in to compliment the purple even more. 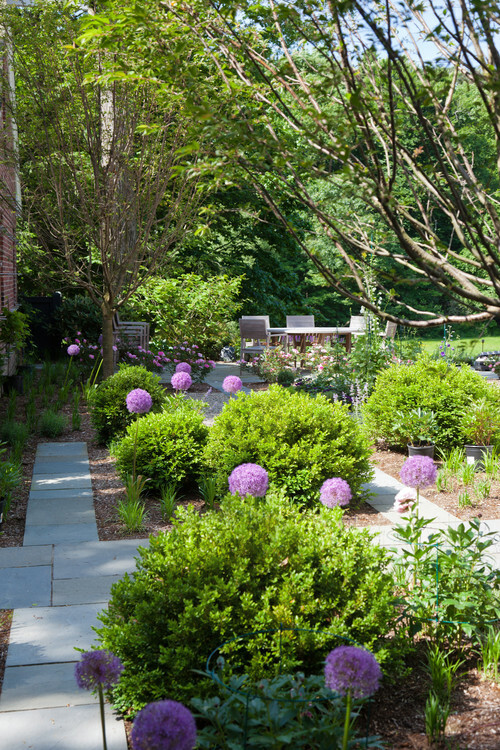 Another great use of allium and a deep purple variety. 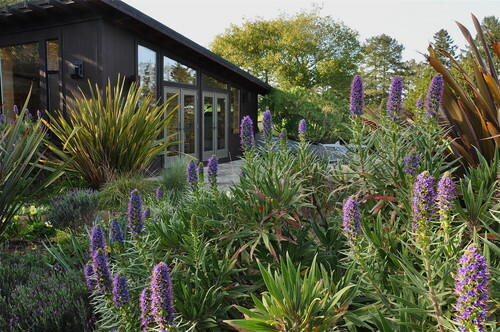 There is also some lower growing purple flowers in the foreground and you can see a play with the gradients of green in the back of the garden. The most striking though are the allium which stand tall and round and fire balls of bright colour high up in the garden design. 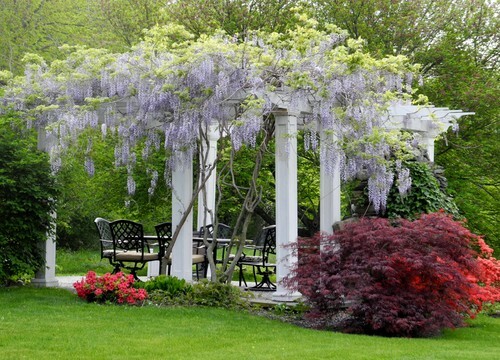 For a pergola there is not much better than a wisteria to bring some hanging colour to your frame. The vine like plant produces plenty of hanging flowers that add a really nice splash of colour to the higher regions of your garden design and it can be a great way to raise the eye and create shade. This is where Allium comes into it’s own. The success of buxus as the formal garden bush of choice has meant that allium is it’s natural colourful friend as it boasts a perfectly round shape similar to that of the buxus bush. 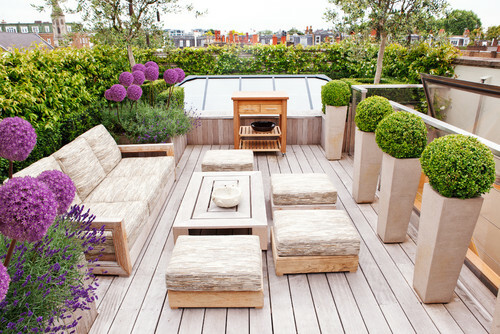 In this design the garden has been split with purple balls on one side and green balls on the other and muted beige planters and furnishing in between so not to detract from the feature of the plants.